I had a little time in the craft room this past weekend I have seen lots of stencils and paste used with ink blended background lately so I thought I would play with this technique a little today. I cut a square piece of cardstock and used a die cut to create a window. I made a slightly small square from some watercolour paper and did some ink blending. I pulled out my Faber Castel - glass bead paste and a stencil and added some texture over the blended ink. Once it was all dry I added some sentiments to the top panel and popped it up with foam tape. Supplies: White cardstock, Verve - Anniversary Birda, GRS Stencils - Distortion, Simon Says Stamps - Double Heart die. 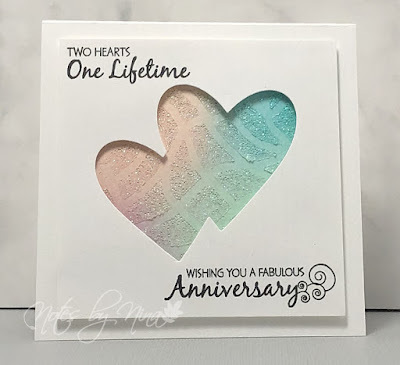 love your card ...like the blending you did ...might have to try this out. they are going to love this card.